They're confident enough in their masculinity. Pop quiz! What are the two major weaknesses of the U.A. deck? Think about that for a second. I'll let you. The answers are lack of play if you don't draw RotA or Midfielder, and that the Extra Deck is mostly unneeded. Do you know what helps to alleviate both of these problems? 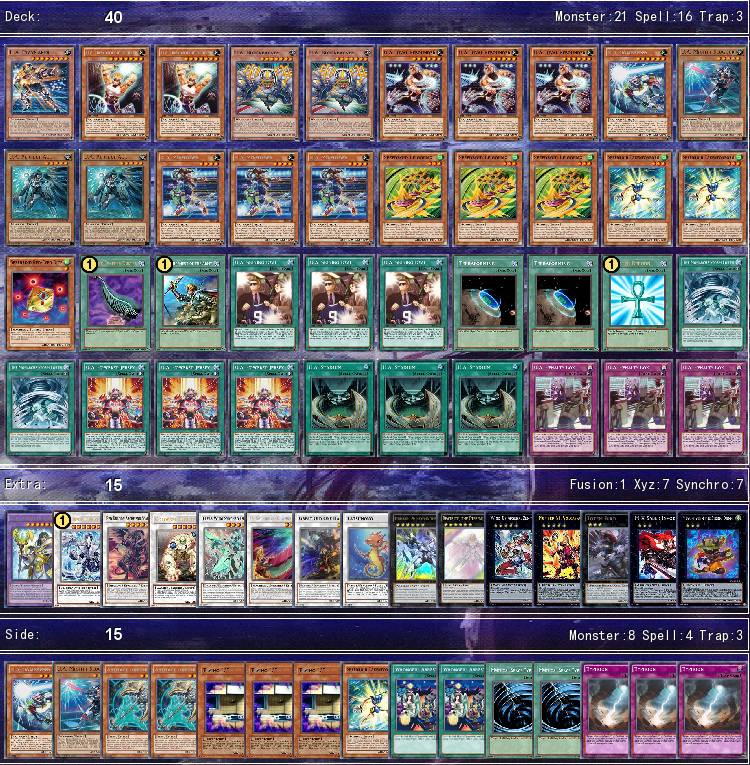 Well, you already read the title of the thread and probably looked at the decklist, so I hope you do. Speedroids! Not only can they swarm rather quickly, but they have some decent searching options, Xyz options, and even Synchro options. Nothing quite as fun as summoning Tatsunoko and your opponent's jaw dropping as you make a play from your otherwise dead hand. But do you want to know the real kicker? You have it. You have the one needed godsend for the deck. Beatrice is one of the godsends of the OCG, as it opens up the most easy and consistent way to send your Penalty Box to the Graveyard, and she also summons an even stronger beater when your opponent overcomes her, all without the crummy side effect of it not being able to use the effect the turn it is summoned! But wait, there's more. U.A. Rival Rebounder, a rather awful card in a pure U.A. deck gets a significant boost in usability with this, as well. When Normal Summoned, his effect triggers. Konami thought they were being cheeky when they included that one, I'll bet. I wish that there was more space for extra copies of Goalkeeper for consistency's sake, but you'd be surprised how hard it was to fit another copy even into the Side Deck. Space is pretty tight, but the deck has leagues (sports pun) more consistency than you'd expect from a U.A. deck. Who says clowns and circuses have to be the only source of entertaining? Who doesn't love toys? Who doesn't love sports? (technically YGO could be considered a sport, too). Entertaining dueling is a broader concept than you once thought, huh? I guessed Konami was the two major weaknesses of the UA deck. That's weakness 2.5. Konami not giving a deck the treatment it deserves because another deck has more in terms of profits. Same as Kozmo getting 500 cards but Kaiju being forgotten. Why do you see Rival Rebounder as awful in a pure U.A. deck? Normal Summoning him is an inconsistent mess, you only have 3 Signing Deal, and some in the TCG don't even run 3. Using his effect during the opponent's turn also cuts off the Extra Deck play otherwise possible. I'd argue the second effect is worse than the first for that reason. Here, we have more ways to get off that summon, and in general his level supports him far more than it would in the TCG. Personally, I think if you've managed to use rebounder in pure, you're probably ina position where you're already winning. The only way you can proc in the opponent's turn is through midfielder, which doesn't need an explanation as to why you're already dominiating. Normalling implies that you already have a u.a. on the field, at which point you're probably just going to pull it out of the grave anyways, thus coming out with nothing but losing the atk bonus on the tributed monster. Searching it is also bad because that's so ridiculously slow and it does absolutely nothing for defense. Hsr instead lets you ss while searching and pull magic with invoker by suddenly having 3 cards boosted by stadium and being able to pull back midfielder for maybe dunker or similar. I never really had any problems with Special Summoning him during the opponent's turn thanks to Midfielder. In fact, I've had plenty of fun negating a card with Perfect Ace, bouncing him back with Midfielder, and then summoning Rival Rebounder to summon the discarded U.A.. Or even summoning Perfect Ace again to get two negations a turn. I do see Sakuya's point but it has helped me keep ahead at times. Right, I suppose it's been a bit long so I'll get to your deck: I like the creativity behind the idea and the meshing of the ideas, providing tribute fodder and tribute monsters in turn. Do you think triple Powered Jersey might be a bit much, though? It's definitely a powerful card but I can't help but feel that three would clog at times. Do you think triple Powered Jersey might be a bit much, though? It's definitely a powerful card but I can't help but feel that three would clog at times. Personally? I like it. I know your sentiment, though. I feel iffy when I see triple Rescue Rabbit in decks that only use 3 Normal Monsters. Before Pendulum Summoning, this was... Really awful, to me. And even now it's not ideal, you know? The idea is that the benefits can usually outweigh the consequences. Did you know there was one single U.A. deck that's placed in a Japanese tournament thus far? It used Chain Summoning, of all things. That felt really weird to me, but after thinking long and hard, for a pure deck, it wasn't too bad of a choice. It completely solves the Normal Summoning issue despite being a little difficult to pull off and somewhat situational... Or so I thought. That card turns Stadium into a powerful searcher, as it is not once-per-turn, just limited by your ability to Normal Summon. Now, I respect that deck, which I believe also used 3 Power Jersey, but alas. I still wanted to have a different take on it. I don't think that it is a strong enough boost for me to personally use it. One major point I do agree on is that 3 is sometimes not the best. But having 3 gives me a perfect idea of what to side out, sometimes. I've done some testing, but ultimately the deck won't be completely competent until the community at large settles down from all of the imports. Between Monarchs, Burning Abyss, and some other oddities coming up, and the ban list, it is not exactly the most secure time for deck testing. So I think 3 is okay, but sometimes it the 3rd copy is the first choice to side out.